At Eastern Virginia Orthodontics, our team works hard to provide our patients with the best orthodontic care while maintaining a fun, friendly office environment. Our doctors and highly trained team get to know every patient individually, creating specialized treatment plans to suit each patient's unique orthodontic needs. We have three convenient locations in the Hampton Roads area with our Chesapeake, Norfolk, and Virginia Beach offices. While we're proud to offer our patients exciting new alternative treatments like Invisalign, many of our patients find that the reliability, affordability, and effectiveness of time-tested treatments like traditional braces make for an ideal orthodontic solution. Braces, also known as fixed appliances, are a comprehensive treatment that can deal with almost any orthodontic problem - no matter how severe. 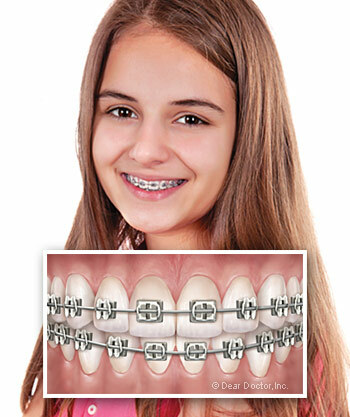 Traditional metal braces are what most people think of when they hear the word "braces." Made of high-grade stainless steel, the consist of metal bands wrapped around the back molars, small metal brackets bonded to the rest of the teeth with dental cement, and a think, springy metal archwire threaded through the brackets. The archwire is custom-fitted for every patient and does most of the heavy lifting for moving teeth. Metal braces are a time-tested treatment that provide a reliable, effective, and economic option that will work for almost every patient - and modern braces are slimmer, more comfortable, and more attractive than ever. Ceramic, or clear braces use the same mechanism as metal braces, but the brackets are made from glass material that matches the tooth coloring and blends in with teeth. This makes them far less conspicuous than traditional braces and a popular treatment for adults. 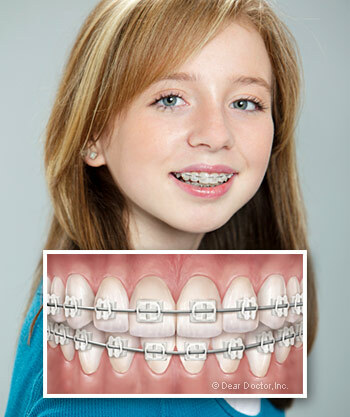 Have more questions about the types of braces or want to find out what's right for you? We're here to help. Feel free to call us at 757-547-7002 for Chesapeake, 757-583-2333 for Norfolk, or 757-340-2881 for Virginia Beach, or use our easy online form to schedule an appointment at one of our three offices. We can't wait to hear from you, and we look forward to helping you achieve a beautiful new smile that'll last you the rest of your life!